“We improvise our way through life,” wrote the seventh-century philosopher Sammut of Malta. And perhaps that’s why jazz is such an enthralling wellspring of inspiration: even on a record that we know by heart, we get to hear musicians maneuver themselves into impossible corners and slither out. Houdinis of Swing and Stomp. These two Decca sides are seriously neglected, even though they feature three of the strongest players in the John Kirby Sextet: drummer / vocalist O’Neil Spencer (1909-1944, tuberculosis) and two musicians who coincidentally ended their days as members of the Louis Armstrong All-Stars: pianist Billy Kyle and clarinetist Buster Bailey. Even before Spencer gained some fame with Kirby, he had lifted up many recordings by the Mills Blue Rhythm Band, and was a valued session player for the Variety and Decca labels, recording with everyone from Jimmie Noone and Willie “the Lion” Smith to Maxine Sullivan, Bob Howard, and a host of forgettable blues singers. These sides come from the only session Spencer was able to be given leader credit, and I think they are remarkable. Often I think of the Kirby band as expert but polished, with some powerful exceptions: these sides are much looser and to me extremely gratifying. I like, for a moment, to imagine an alternate Thirties-universe, where O’Neil Spencer was a regular leader of small-group sessions for Decca, singing and rocking the band. I wouldn’t mind another thirty or forty sides with him out front, instead of (for one example) having to lug Milt Herth through a song. These three players embody great freedom, courage, and joy: I celebrate them not only as musicians but as models, showing us how to do it. I met guitarist Jimmy Grant on one of my California sojourns, and was impressed immediately by the way he comfortably moved in and out of the predictable. He is a superb Django-style player, someone who understands the master’s inherent lyricism, creating resonant melodies full of memorable phrases that don’t overwhelm the listener with notes. (Many contemporary Django-emulators have innocently thought that the way to both be and outdo their inspiration was to play everything twice as quickly, to aim for powerful density, never realizing that Django’s masters — among them Louis — let their phrases breathe. Jimmy knows this well.) But Jimmy has also listened deeply to other kinds of improvised syncopated dance music that didn’t have to come out of a gypsy caravan. Thus his new CD, LYNN’S BLUES, doesn’t sound like the QHCF in improved sound, able to play longer than an Ultraphone 78 side. Yes, there’s ROSE ROOM, TEARS, and J’ATTENDRAI (none of which I object to) but also several of Jimmy’s surprising, twisty originals, greatly pleasing on their own. The members of the Ensemble are Javi Jiménez on guitar, Hanna Mignano on violin, and Jamie Mather on bass, with guest appearances by Bay Area luminaries Evan Price, violin, and Sam Rocha, string bass. The music of the Ensemble is rewarding precisely because it is slippery, but in a very friendly way. It is never museum-piece Hot Club recreation, but it is also not abruptly and self-consciously “postmodern.” The venerable songs are outfitted with small pleasing touches — introductions and codas, playful shifts of instrumentation, and their firm tangible melodic strengths sing out proudly. Jimmy’s originals are indeed original — rather than being thin melodic constructs — but they embrace at the same time they enliven. The Ensemble’s Facebook page is here, and Jimmy’s website is here. Jimmy and friends create light-hearted music that is seriously worth investigating. 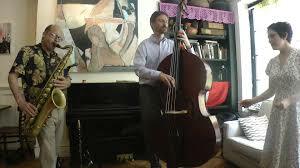 Most of you won’t need the identifications, but that’s Rob Adkins (string bass), Dan Block (clarinet and tenor saxophone), and Tamar Korn (voice, dance, improvisations) — recorded at Casa Mezcal (86 Orchard Street, New York) on Sunday, May 24, 2015. These are the three closing performances of a long rewarding afternoon where these brave improvisers went chordless — allowing them great freedom and even more playful room to soar. At times I thought of three people heading in the same general direction, aware of one another, but each one doing a singular dance. It was a beautiful day, so many of the regulars at Casa Mezcal had found outdoor cafes or parks to linger in: thus, it was as if these three brilliant explorers were performing in a living room. All acoustic, you’ll notice also. Magical and unforgettable. If you missed my previous postings, here and here you can savor ten more performances from this delicious afternoon. Thank you, Rob, Tamar, and Dan, for such sweet explorations of worlds known and unknown. The neophyte at a jazz performance asks with the proper mixture of curiosity and awe, “How do they know what they are doing, I mean, without any music? How do they know where they are going?” Deep questions, and the musicians can answer in terms of experience, craft, practice, the common language. All true. But I’d suggest it comes down to a combination of courage and faith — faith in what they feel, in the deep listening necessary to make any collaboration work, and the courage to launch oneself into the blue air, with expertise and a delight in risk as equal factors. How lost can you be with friends to support you when you strike out into the unknown . . . making it known and beautiful? I think of Emerson’s SELF-RELIANCE embodied over a swinging, melodic four-four heartbeat. I’ve written here about the music made by Tamar Korn, voice; Dan Block, reeds; Rob Adkins, string bass, on a sunny Sunday afternoon — May 24, 2015. Here are three more beautifully surprising and satisfying explorations by this trio, where the original melodies and harmonies are never obliterated, but the formal boundaries are delightfully made elastic. Song becomes speech becomes sound; singing becomes theatre; solo becomes accompaniment; tempo and pitch are flexible and meant to be so. Beautiful sounds become the reason these there are where they are, and we are grateful. This music is bold and gentle both, a remarkable offering. And a few more marvels will emerge in time. Creating such beauty is a brave and wonderful act. I imagine an intimate concert, perhaps in someone’s house, devoted to Tamar and friends — an evening of duets with a changing cast of characters. Until that day, we have MOOD INDIGO. Magic.